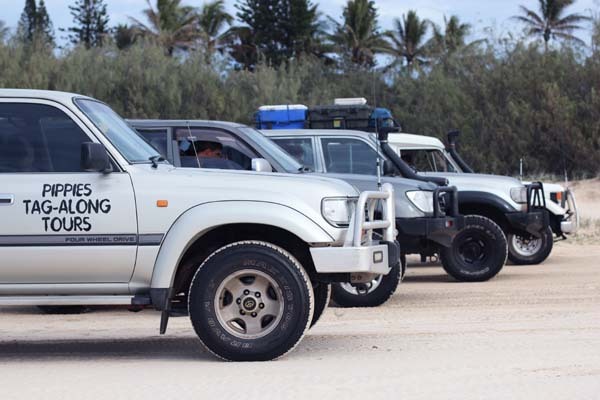 Experience the world heritage listed Fraser Island your way, enjoy the sights and wildlife of this majestic island with the ultimate 4×4 adventure. Whether it’s a family holiday, couple getaway or group adventure Pippies can assist with car hire, permits and camping requirements. Pippies operates a fleet of Toyota Landcruisers which are all automatic, ensuring even the inexperienced driver can enjoy this adventure. All vehicles are maintained to the highest safety standards with a safety briefing and driver training provided. Surfing in Rainbow Beach, home to the longest surf break in Australia! Head out at the front beach for a morning Surf lesson. Bodyboarding Free Bodyboard hire is available for all Pippies Beachhouse guests, enquire at reception on arrival. Double Island Point is a scenic headland offering mesmerising views along the beach and out to sea. The easiest way to visit Double Island Point is by a four-wheel-drive vehicle along the beach. A gateway to so many adventure activities! If you like day walks it’s a full day hike from Rainbow Beach return. 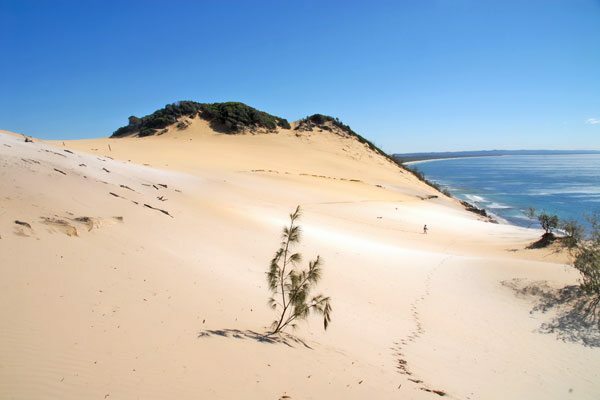 Follow the historic lighthouse telegraph line along the high coastal dunes, climb the steep track to the Double Island Point lighthouse to view abundant wildlife, walking back to Rainbow Beach along the shore line with views of the amazing coloured sands on return. 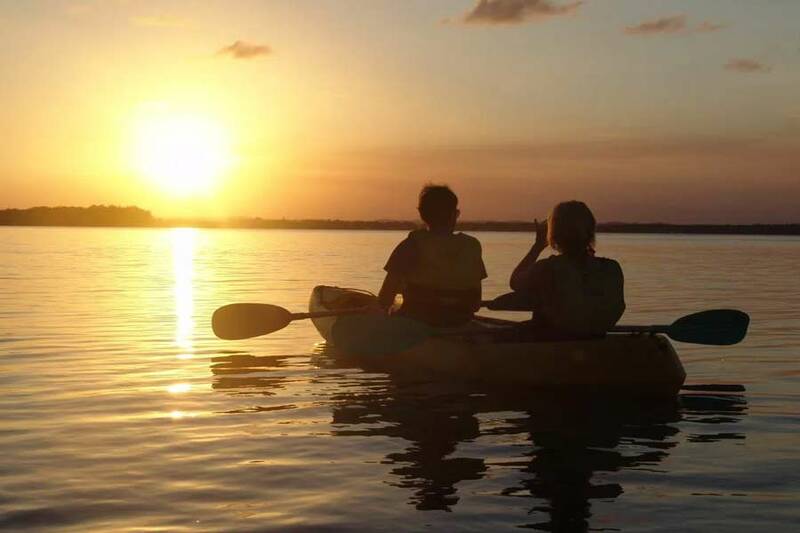 Book a Kayak tour and experience Mother Nature at her very best. Double Island Point is Rainbow Beach’s hidden gem and is only accessible by 4WD or a 2.5hour walk one way. Home to an abundance of marine and wildlife your chances of seeing dolphins on this tour are very high (90%).Humpback whales (June – November), turtles, manta rays, sting rays, soldier crabs in their thousands and migrating sea birds are all common sightings on this adventure! 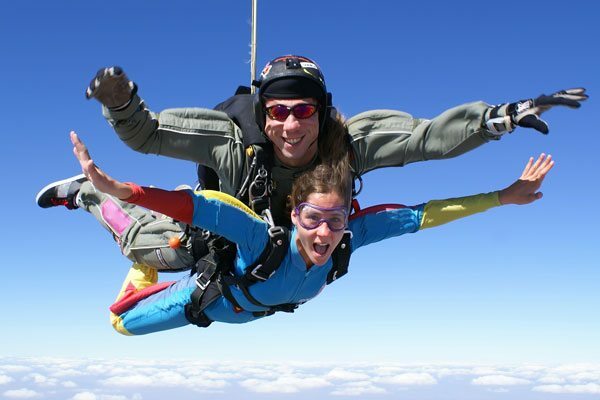 Tandem Skydive Fraser Island for an unforgettable and thrilling experience in this spectacular location. Freefall from 15,000ft for up to 60 seconds with views of Fraser Island, and the Great Sandy National Park surrounding Beautiful Rainbow Beach. The Carlo Sand Blow is a natural “moonscape” sand dune covering over 15 hectares. 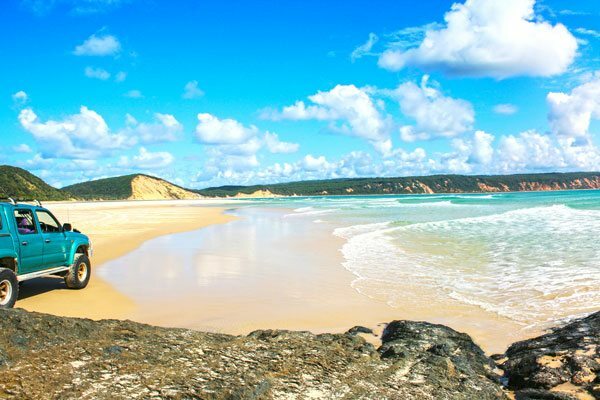 Overlooking the breathtaking coloured sands and the coastline from Double Island Point to Inskip Peninsula and the southern tip of Fraser Island. Named after one of Captain Cook’s deck crew. Drive to the carpark at the top of Cooloola Drive, otherwise a 30minute walk from Pippies Beachhouse. Then take the easy 600-metre nature walk from Cooloola Drive. Get there in the afternoon with time to take in the sun setting over Tin Can Bay and the Great Sandy Straits. Also breathtaking at sunrise, this is a must do while in Rainbow Beach. This track is also the entrance to the Cooloola Great Walk. Walk south along the beach from the end of the main street for at least 30 minutes to the start of the towering cliffs of coloured sand. 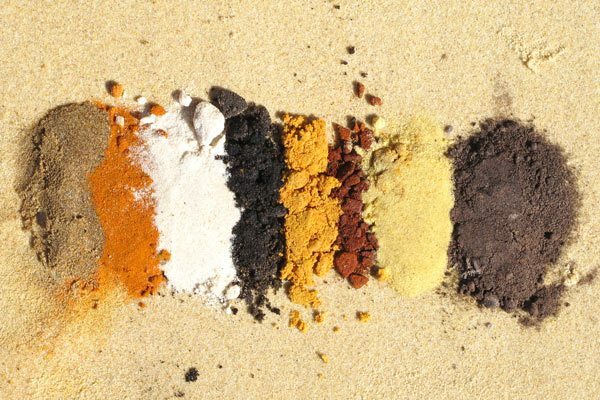 Striking coloured sand with a blend of colours from orange, brown, pink, silver, gold, grey black + more. Truly one of nature’s great masterpieces with a palette of as many as 72 different coloured sands. 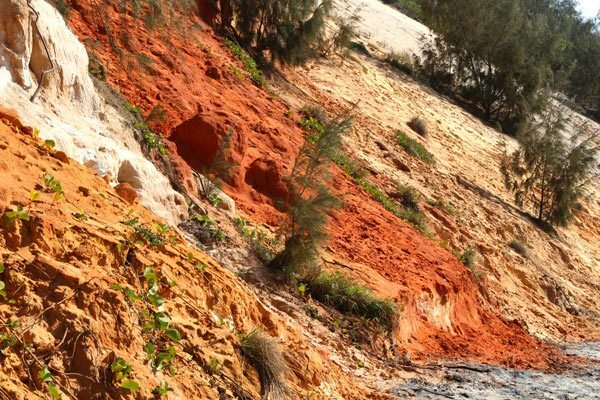 The town’s name derives from the rainbow-coloured sand dunes surrounding the settlement; according to the legends of the Kabi people, the dunes were coloured when Yiningie, a spirit represented by a rainbow, plunged into the cliffs after doing battle with an evil tribesman. 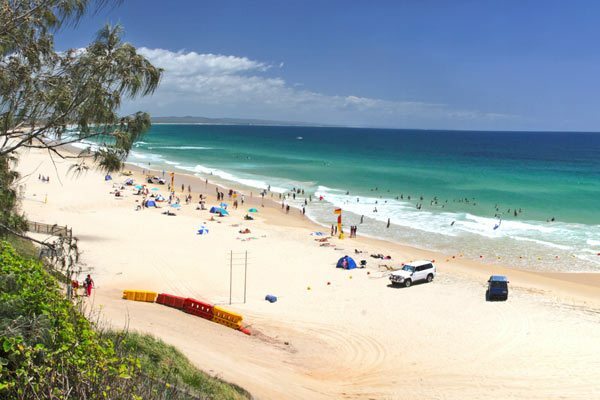 Our beautiful surf beach is patrolled all year round by both professional lifeguards and volunteers. The flagged area is netted for your peace of mind so don’t forget to swim between the flags. Body boards are available to use, enquire at reception. 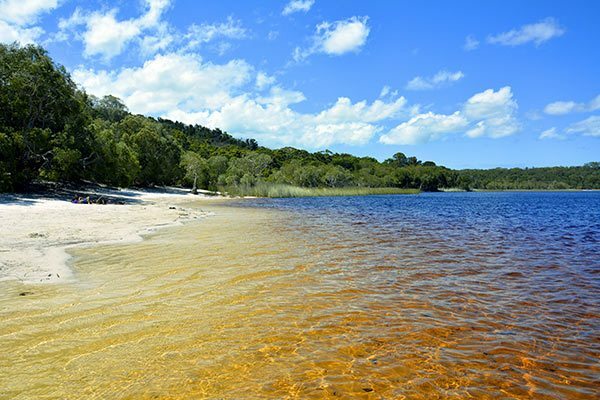 A beautiful tea-coloured freshwater lake surrounded by a white sandy beach. A great day walk from Pippies Beach house, otherwise a short drive to the Bymien picnic area and a 2.2km walk to this beautiful perched lake for a cool refreshing swim. 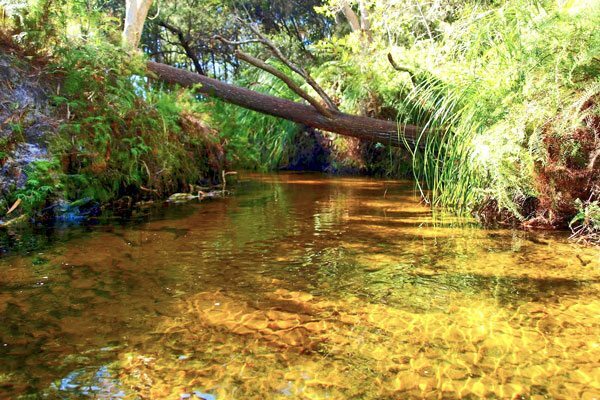 Discover refreshing swimming holes at Seary’s Creek day rest area on Rainbow Beach Road, seven and a half kilometres south of Rainbow Beach. The 100-metre wheel chair accessible timber boardwalk passes through heath and low woodland to a refreshingly chilly crystal clear creek. Wolf Rock is a dedicated marine sanctuary located just off Double Island Point. Long been considered easily one of the best dives in Australia! 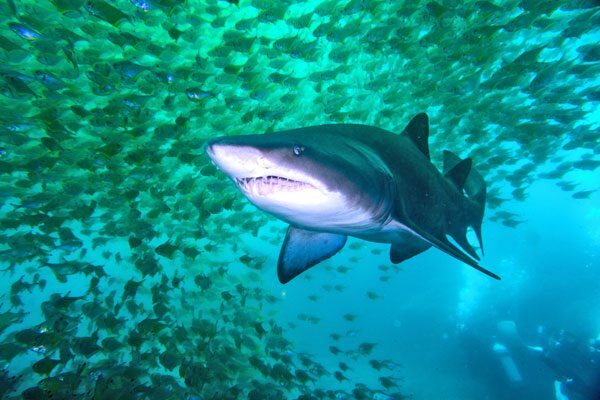 Large numbers of the critically endangered Grey Nurse Shark are found here all year round as it is the only known aggregation site for these sharks in Queensland. Summer at Wolf Rock brings warmer water and with it, the decidedly photogenic Leopard (Zebra) Shark, Wobbegong Sharks and large numbers of White-Spotted Eagle Rays, Marbled Fantail (Bull) Rays and Pink Whip Rays. All often putting on an impressive display around the submerged volcanic pinnacles that make up the dive site. During the winter months, you can expect to see a multitude of migrating Humpback Whales. 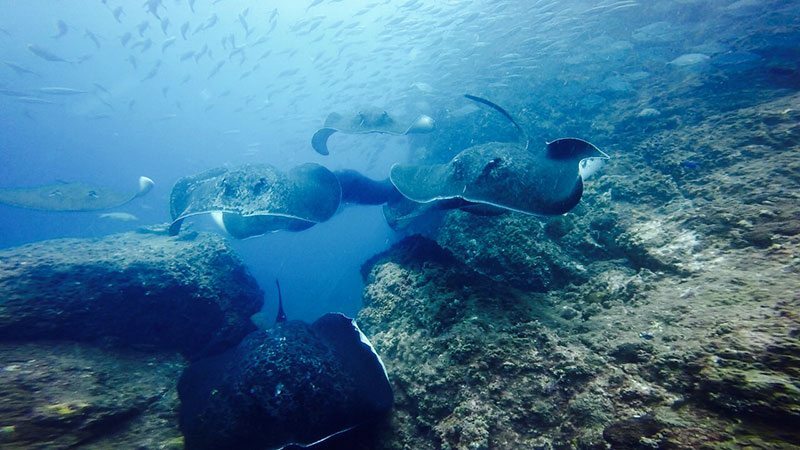 (if you are lucky enough you may even see one underwater) Large numbers of the always majestic Manta Rays also frequent the site during the cooler months. Add to that the regular year-round sightings of at least three different species of sea Turtle, Giant Queensland Grouper and masses of schooling pelagic fish such as Trevally, Mackerel, Mulloway and Barracuda. The rock itself is home to hard and soft corals, anemone fish, nudibranchs, octopus, Moray Eels and sea snakes. Do a days diving at Wolf Rock and it is easy to see why it is highly regarded around the World as the best Shark and Ray dive in Australia.